So tell me a bit about how you got to where you are today. I went to high school in Manhattan, not too far from where I work now actually. Elisabeth Irwin but most know it by Little Red. When you’re growing up in the city, or maybe because I went to a particularly artsy school, it felt like everyone's parents were artists, or musicians, or worked in fashion. So it felt like a very tangible industry, which I guess is a little ridiculous. At the end of high school, part of the curriculum was an internship, so I ended up interning at this agency that represents various photographers and makeup artists. But I was definitely more drawn to the journalism side of the industry. So when I went to Rutgers, I majored in English and Journalism and wrote for the school paper. Then senior year I interned at WWD. It was definitely, as a lot of internships are, a monotonous position but I met a lot of cool girls whose interests matched mine and having the opportunity to go on set and to see all of that firsthand was definitely a good experience. During fashion week we would run the memory cards between the shows and our office. So we would go and meet all of the photographers at each show, which was pretty cool and I also managed to sneak into a lot of shows. 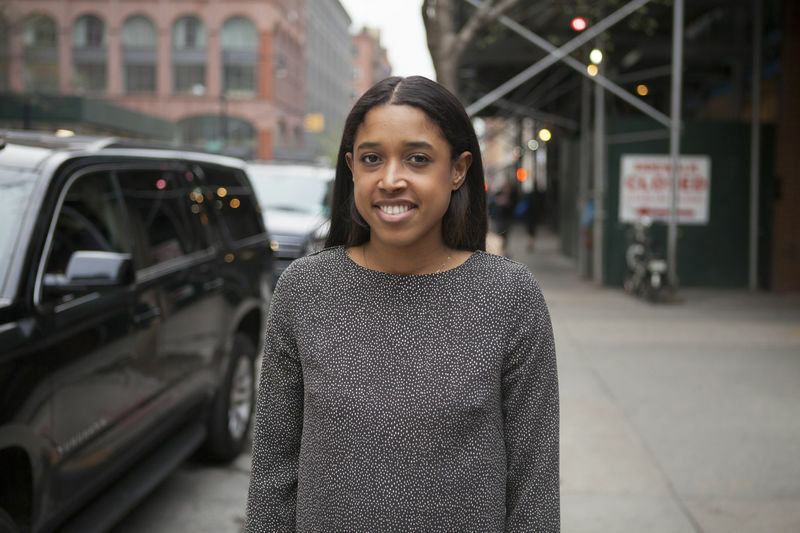 I was always pretty confident that I wanted to be on the journalism side of the industry but being open minded definitely helped as Mode PR ended up giving me my first full-time position. So right out of college, I became the accessories and swimwear account manager. I had like 8 accounts and no idea what I was doing but I went with it. In the back of my mind I was like, "I'm a writer. I don't want to be writing pitches. I want to be interviewing designers. I want to be telling their stories." I ended up emailing the market editor at The Cut as I’d worked with her quite a bit at Mode. She got back to me and said, "Actually, we're relaunching the site, and we need some extra hands to help us with production if you want to come in, we can talk about that." So I did and ended up getting hired as a freelance producer. For an entire summer, day in and day out, I was pulling photos off of Getty Images, putting together these lookbooks, which now I oversee. Then September rolled around, and they needed extra help for fashion week, too. They overhauled the whole runway page, and we had galleries of each show from runway, to beauty, and we had to tag everything meticulously by trend. They asked if I’d run production on the runway during the day, which is super intimidating because you're the one pushing things out live and if you mess up it's going to fall on you. But I was like, "Alright. I'll give it a shot." After that, I was kept on as a freelancer for a couple of years, working on a lot of slideshow building and photo research until finally my boss, Sally Holmes, was moving on. She went to Elle, where she still is. But right before, she sat me down and asked, "Hey, would you like to take my position as The Cut's fashion producer?" I was totally blindsided; I went into the meeting thinking that I was getting fired or something. And she was like, "Oh no! I'm leaving. And do you want my job?" And I was like, "Okay!" That must have been nerve-wracking. Yeah, a little bit. So then I became The Cut's fashion producer, and I've been in that role ever since. A lot of it is making sure that everything is working on the site. Updating the home page throughout the day, looking at traffic and deciding, alright, a thousand people are looking at this post, where should it be on the homepage, so it gains even more traction? Do you learn about your target audience by what they're drawn to? Honestly, there is a formula, but there isn't. It's surprising how stories go viral by somebody famous tweeting it or it getting posted on Reddit. We know our audience, but I think that sometimes stories that we don't anticipate will get shared, and all of a sudden they blow up. When I’m updating the homepage I’m deciding, "Okay, this article has a beautiful photo. Let's highlight that." And then, I still look over the lookbook archive, which is an extensive collection of mostly celebrity style or anyone that we think is worthy of flipping through 100 looks that they've worn. For instance, Jenna Lyons has a lookbook. And then, during Fashion Week, I'm overseeing the full show. I hire a team of interns and freelancers. A lot of it is coordinating with IMAXtree, which is a photo agency that we work with. But I still have to request the access for those photographers to get in the show. If someone can't get into the show, I'm figuring out what to do with the PR people. I think having been in PR and understanding what it's like to be on that side, helps me do my job better now. Do you have a favorite part of your role or one that's the most rewarding? What I love about The Cut is that we talk about things that pertain to women in every aspect and intertwine them all. It's a site where we can talk about fashion and politics and how they merge. I love being part of the team here. Even though I'm responsible for a lot, my ideas are always welcome for things that are outside of my role. For instance, if I want to write or contribute to the conversations that they're having about what to cover or who to feature, my ideas are taken into account. It's not like, "Oh, you're a producer, so you don't have any say in this." Have you learned any tactics for interviewing people? You have to work with what you have. I think my problem is, is that I go into it already having a story in my head about this person, and then I find out that everything I assumed is wrong and it's hard not to write the story that you thought you were going to write and instead write the story that they're telling you. When you knew you wanted to go down the editorial path, were you ever concerned about being stuck at your desk? Well, it's hard because you don't want to get pigeonholed by your role, I work hard to grow whatever part of my role that I feel is lacking. Recently I did an interview with this girl, Leah Dou. Even though I wasn't styling the shoot, I conducted the interview and got to be on set that day. Being close enough to those hands-on things and having the opportunity arise once in awhile is great for me. And your biggest learning experience? How many people do you oversee? I hire about 6 interns every season. When you're interviewing people, what do you look for? I'm always surprised by how many applications I get that don't mention that they've read The Cut or what they like about The Cut or why they want the particular job. I look for people who seem genuinely interested in our site and what we do, and have a reason for wanting to join. And that they haven't blindly sent in their resume. Actually the last round there was this person who had almost too much experience. They had done 10 internships, and I thought alright, this person probably would probably do a good job but instead I’ll go with the girl who had only interned at 1 place as she was really genuine. I also thought it could really help her.